Thursday 25th September 2014 – 2.50pm – Claire Brown. 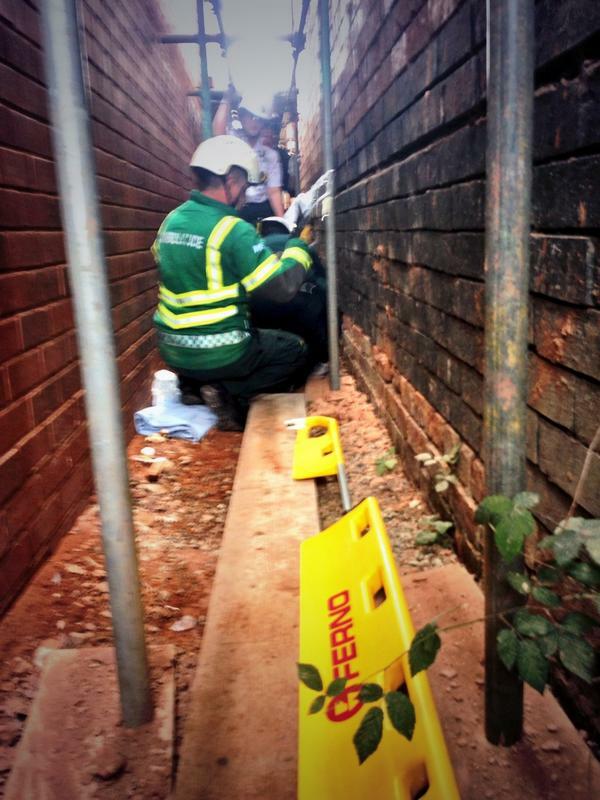 Specialist paramedics and a medic were needed to help treat a man who had fallen from scaffolding, landing in a narrow passageway between two properties, in Birmingham. West Midlands Ambulance Service was called to Bells Lane, Kings Heath shortly before 11.00am this morning (Thursday). Paramedics from the Trust’s Hazardous Area Response Team, a MERIT trauma doctor, a responder paramedic and an ambulance crew were sent to the scene. A West Midlands Ambulance Service spokeswoman said: “The man, believed to be in his 50s, had fallen approximately six feet from scaffolding landing in a narrow passageway about three feet wide. Upon assessment, ambulance staff found he had sustained a minor head injury and a suspected spinal injury in the fall and required immobilisation. The man was given intravenous analgesia to stabilise his condition. “Due to the difficult location, ambulance staff on scene requested HART paramedics to help with immobilising the patient in the confined space.